β-Glucans have been consumed for many centuries for their healing properties. Since the discovery of their immunomodulating capabilities, about five decades ago, β-glucans have attracted a great deal of attention in the biomedical arena. Numerous articles have reported the biological activities of β-glucans including anti-infective, anticancer and wound repair activities. Unfortunately, many inconsistencies and contradictions remain unresolved. β-Glucans are carbohydrates consisting of a backbone of glucose residues joined by β-(1➝3) linkages with β(1➝6) linked glucose side-chain residues. These polysaccharides are major cell wall structural components in fungi and are also found in plants and some bacteria. Depending on the source, β-glucans vary in the type of linkage, the degree of branching, molecular weight and tertiary structure. β-Glucans are not synthesized by animals and thus are recognized by the innate immune system as pathogen-associated molecular patterns. This recognition is mediated by pattern recognition receptors and, among them, Dectin-1 has emerged as the primary receptor for these carbohydrates . Dectin-1 is a C-type lectin receptor expressed primarily by cells of myeloid origin, including macrophages, dendritic cells and neutrophils. 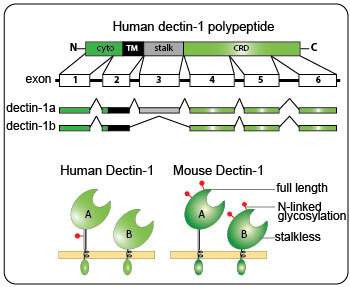 In human and mouse, Dectin-1 is alternatively spliced into two major isoforms, a full-length A isoform and a "stalkless" B isoform. Human Dectin-1 (hDectin-1) is structurally similar to mouse Dectin-1 (mDectin-1) with 60% identity in amino acid sequence, but display differences in the number and position of N-linked glycosylation. N-linked glycosylation has been shown to affect the cell surface expression and ligand binding of Dectin-1  and may explain some of the contradictory results published in the literature. Binding of β-glucans to Dectin-1 triggers a variety of cellular responses via the Syk/CARD9 signaling pathway, including phagocytosis, respiratory burst and secretion of cytokines. Although not yet fully understood, the ability of β-glucans to induce these cellular responses is influenced by their macromolecular structure. Dectin-1 is usually described as a β(1-3)-linked glucan specific receptor. However, we along with others  have found that linear β(1-6)-linked glucans, such as the lichen β-glucan pustulan, also bind and activate Dectin-1. It is well accepted that particulate β-glucans, such as the widely used yeast cell-wall fraction zymosan, bind to and activate Dectin-1 inducing cellular responses. 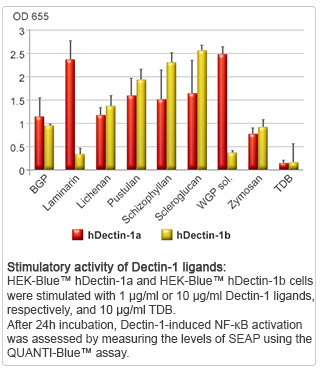 In contrast, the interaction of soluble β-glucans with Dectin-1 is subject to debate. The general consensus, though, is that soluble β-glucans, such as laminarin, bind to Dectin-1 but are unable to initiate signaling . In accordance with published studies on mDectin-1, we found that a soluble mDectin-1 receptor was able to bind particulate as well as soluble β-glucans and that cells expressing the murine dectin-1 gene could respond to particulate but not soluble β-glucans. However, we obtained different responses with hDectin-1. Cells expressing the human stalkless dectin-1b isoform behaved similarly to mDectin-1-expressing cells, whereas cells expressing the human full-length dectin-1a isoform responded to both particulate and soluble β-glucans. We found no data in the literature confirming or contradicting this latter result. Most published studies focus exclusively on the responses of mDectin-1 to β-glucans, which may differ considerably from the response mediated by hDectin-1. In addition to discrepancies between mDectin-1 and hDectin-1, many inconsistencies exist due to the use of very different, and often impure, β-glucans, and the analysis of different cell types and model systems. Recognition of β-glucans by the immune system appears very complex and further studies are required to fully understand the immunomodulating properties of these molecules.